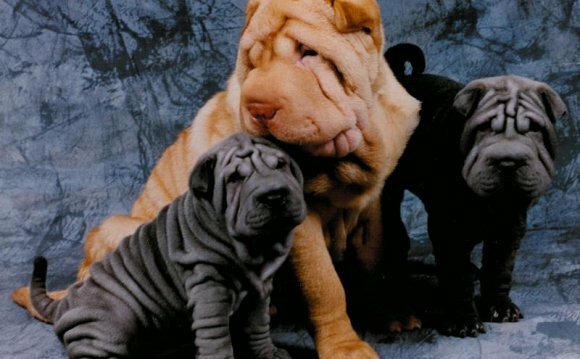 At Royal Shar-Pei, we raise our pups in our home with lots of love. All puppies are house broken and should not have accidents in your home. All puppies are healthy and have received all possible immunizations before they leave here. We guarantee all pet/companion animals for two years. All pets must be spayed or neutered. If you are from out of state and you purchase a puppy from us, we make all the shipping arrangements - (the cost of shipping is paid for by the buyer) all you have to do is show up at the airport to pick up your new pup. We have never had a bad experience flying pups around the world. I always advise my pet owners to neuter their pet dogs. Females are spayed and males are castrated. I have three good reasons for this. The first is medical. Dogs who have been sexually altered live longer, healthier lives because they are not able to develop certain cancers having had their sexual organs removed. The second reason is behavioral. Male dogs are calmer, less apt to challenge other dogs and persons, especially children who may be perceived as lower in social position in the group. They are also less likely to roam. Females are simply more comfortable not having to deal with their heat cycle once or twice a year. The third is reproductive. Unless you are a professional breeder, leave the breeding to the pros who understand genetics, care and placement. With tens of millions off unwanted dogs being euthanized each year for the lack of good homes, there is no reason for casual breeding. If you love your dog, have him or her neutered. It's the right thing to do.